Flowing off both the southern flanks of Volcan Villarica (2840 meters) and Volcan Quetrupillan (2360 meters) is the Rio Llancahue. The river is directly south of the town of Pucon on the opposite side of the volcano. Pronounced Yan-Cow-Weh the river derives its name from Mapudungo or the local Mapuche dialect. the meaning is “place where the llanca is found” and a llanca is small copper colored stones highly prized in Mapuche culture for decorative jewelry and artwork. From Pucon there are two ways to get to the river. the shortest distance is to drive up the Palguin drainage and over the pass between the two volcanoes. The drive is absolutely spectacular but the road can be deplorable and can only be attempted in good weather with a bomber four wheel drive vehcile with high clearance. At the top of the Palguin drainage you enter the Villarica National Park and the road is unmaintained. To find put in follow directions shown below for standard route. Leave Pucon to town of Villarica then go south to Lican Ray then around shores of Lago Calafquen to town of CoÃ±aripe. In center of town take left, following signs to Termas Geometrica. After traveling for 13.8 KM you come to the Termas de Vergara. Continue upstream to where you can first see the river and use the pull out on the right as takeout. If you continue boating past this point heads up as you are entering the middle stretch which has some heinous and un run drops. Travel upstream on same road and you will pass the turn off to the Termas geometricas in 3.2 KM but continue on and in less than 1 KM you will come to a bridge over a tributary called Rio El Venado. There is no sign for the bridge or river but this is one possible put in point. If you choose to put in here there is a waterfall a few hundred meters downstream just above the confluence. Be careful as one year a tree was wedged into these falls. Common option is to drive over the bridge and not very far to the next bridge over main branch. Park at the entrance to Termas de Rincon and put in under the bridge. The elevation here is 900 meters and the takeout elevation is approx 720 m. the river drops 180 meters in 4.4 km for average drop of 40 m/km or 200 FPM. Flow is estimated at 250 to 400 CFS. If you have access to tope maps the river can be found on Liquine. Other nearby runs include Reyeheuco and LLizan. The river is good to do on the way to the Fuy. 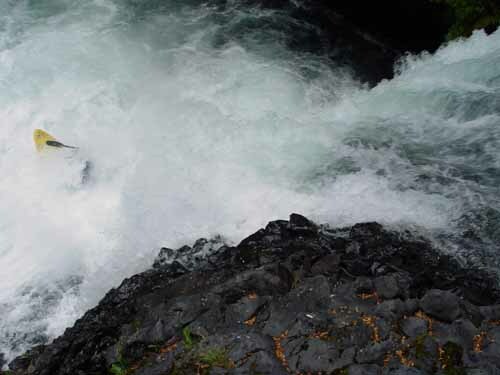 The run is a good class 5 creek with crytal clear water and several waterfalls and possibly several portages. There are several nice things about the Llancahue. One is that if you have had enough at any point you can get out and walk to the road with relative ease. Secondly there are several hotsprings including Vergara, El Rincon and Geometrica. Geometrica is pricey at 10,000 pesos but one of the best in Chile. A third point is that you can find nice car camping at several points along the river. A fourth point is that river really never gets to low so can be run year round. Several groups have ventured further than the above mentioned takeout. 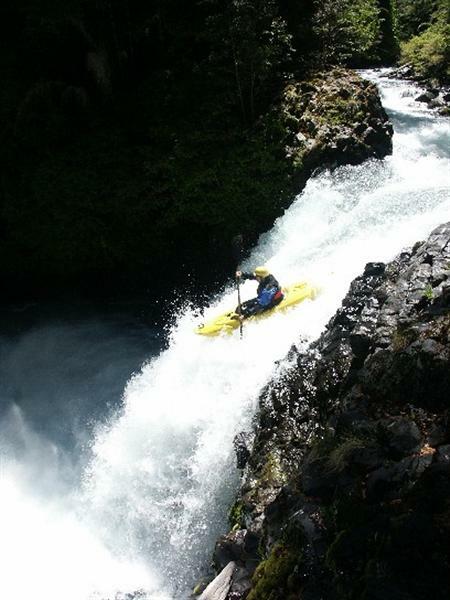 In December 2011 Jared Seiler and crew were the first to succesfully run the complete lower stretch. 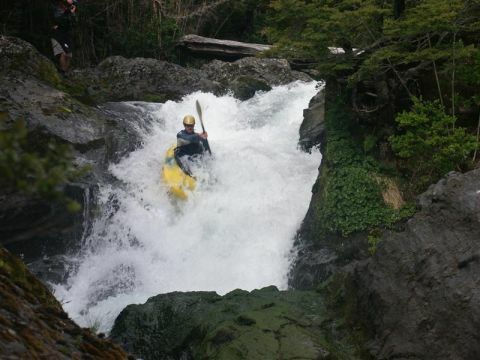 See separate description for this 5+ stretch of stomping whitewater. 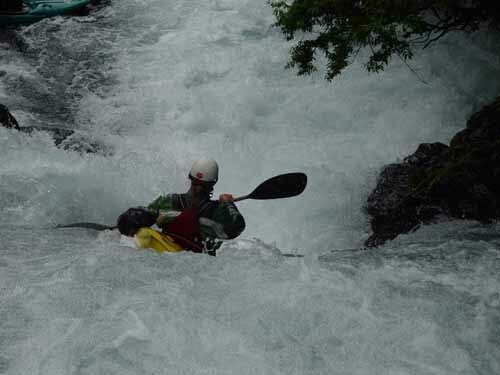 The downstream action is described as burly, intense, and committing with some massive drops and equally difficult portages/scouts. After a run on the creek and a soak in one of the nearby hot springs and you can be back in Pucon sipping Pisco sours within 2 hours. hi kurt really nice job the web site is perefect and show all the qualitys of chile. i am in the picture from llancahue that was taked by cris larsen if is posible could you send me a copy please i really would like to have that photo.